It happens all too often. Someone has a great idea. It gains momentum, picks up speed, maybe even gathers new participants. Heck, sometimes a committee is born. Now it’s an all-out awesome idea! A movement – a movement with a vision and a purpose and objectives. The anticipation and optimism are palpable. The hypothetical ball gets rolling. Great things are starting to happen, and it’s only going to get better! And then it happens. There’s a shift, a turn, an unanticipated plot twist. Suddenly the vision starts to feel “fake” and stakeholder buy-in starts to wane. It’s such a let-down from the rah-rah high of just a few days/weeks/months ago. I know. I’ve been there. How can you stop this from happening? 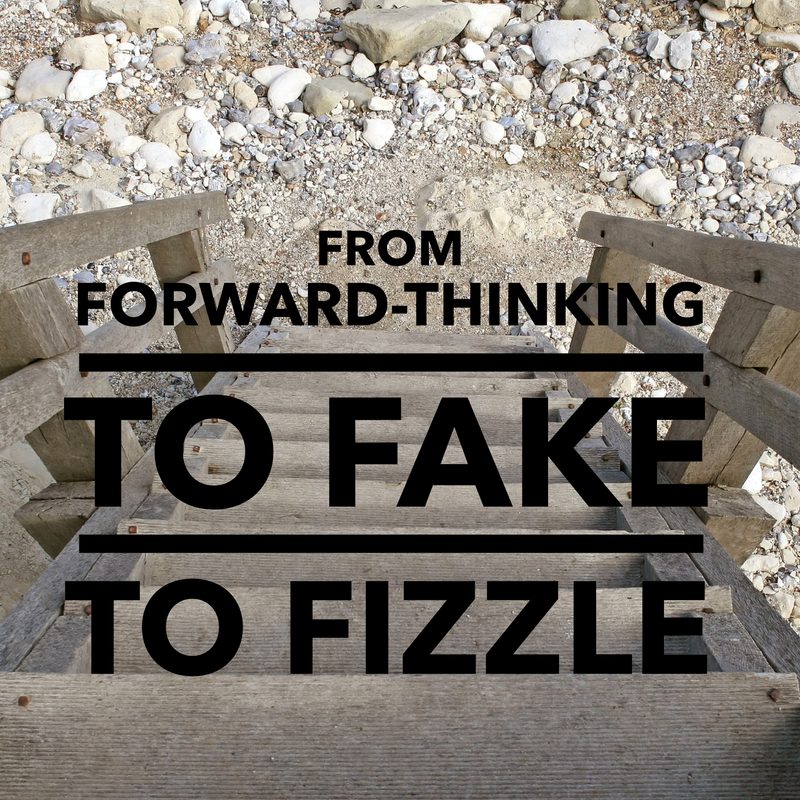 How can you prevent your vision/ mission/ dream project from going from forward thinking – to fake – ﻿to fizzle? 1) Upcycle Your Team: Even if there are only two or three of you, switch roles from time to time. Let everyone feel valued. Is there a hierarchy or is it a group of equal partners? Be open about these roles & responsibilities. If you’re going for equality among all, there should be no secrets or sidebars. 3) Tantalizing Teasers: Always leave a little something fun on the horizon “to be discussed next time”. Ask the team to think about a topic until then, or gather resources, or bring examples & artifacts to share at the next meeting. This gives everyone not only a feeling of importance, but continues to drive that sense of anticipation and looking forward to what’s coming next. This is your greatest chance to block the fizzle. 5) Outsource: Sometimes, you’ve got to think outside the box, and to do that, you need to GO outside your box. Go on a site visit to see how someone else does something. Skype or do a Google Hangout with a guru of some sort. Bring in a guest speaker for a fresh new voice. Maybe a little exposure to a new perspective will be just the impetus needed to but the fire back into your project. 6) Shine a Light On The Elephant in The Room: Don’t hide what’s wrong. Be open about what’s not going well. Let the other guy (or team, or committee) express what THEY think isn’t working. It’s okay. Invite suggestions, and live like you have a perpetual fliud action plan! Bonus: One more idea. Want to know how they’re all really feeling about your big project, idea, or committee? Take an anonymous poll. Put it online; nobody ever really felt anonymous on paper. It’s pretty hard to create a poll or survey that’s unbiased, but that’s what you’ll need to do to get the real truth. And the truth? Well, the truth shall set you free to make informed improvements and get your vision back on track. « Quizzy – Quick & Easy!